This is a 70 male patient 24 days post CRP treatment for 2nd degree grease burns. He was referred for treatment 10 days after being burned. An initial session of CRP was done on 1-31-12 then a second treatment on 2-7-12. These are his results 24 days later. The patient is very active, plays tennis and is an oil painter. Today, 24 days post treatment, he admits that he played tennis and has been painting the past week. 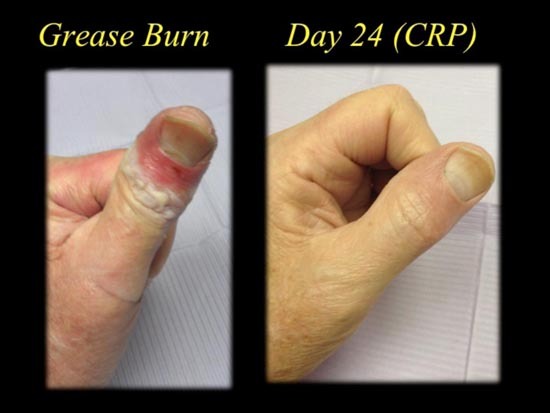 What is important in the initial photo is that the patient was facing a “burn contracture” of the right hand and in the second photo note the black area at the tip of his finger demonstrating “vascular compromise” before and after. The left thumb healing in the last photo speaks for itself. Note the lack of scaring on the thumb and in all the treated areas. CRP does not contain any WBC, RBC or Platelets, just growth factors, cytokines and plasma proteins. 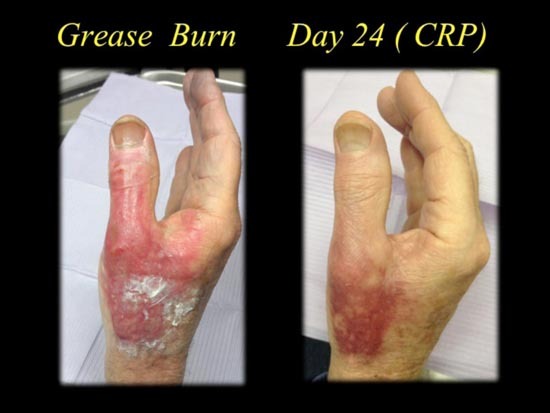 I was curious to see the effectiveness of proteins on serious burns and this case demonstrates the regenerative healing of growth factor therapy and CRP. The purpose of this Case Study was to visually demonstrate the healing capability of your own body without the use of medicines. Regenerative cellular therapy is extremely effective and provides a safe alternative for those patients where traditional medicine has failed.